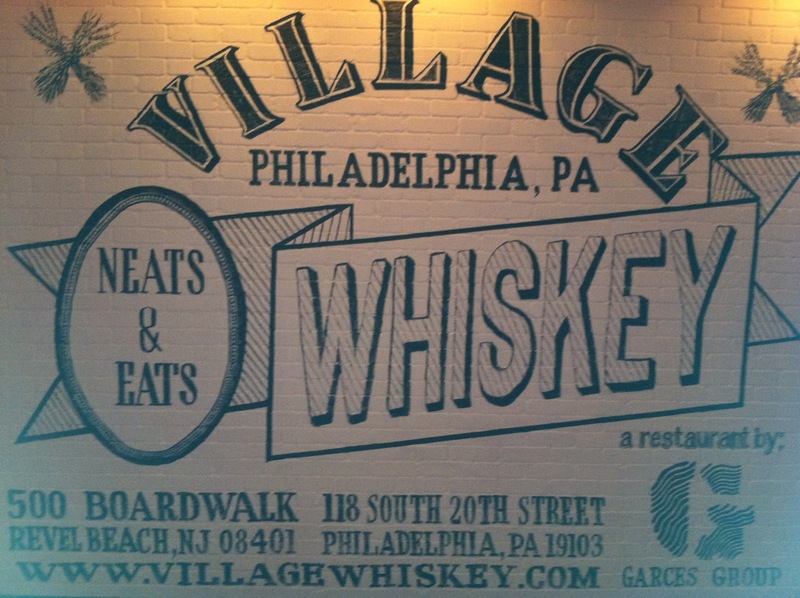 I have gotten so many French fries recommendations for the Village Whiskey in Philadelphia, but had never gotten over there. They have duck fat fries, duck fat being the gold standard in fries, going to Village Whiskey was like going to find the Holy Grail. The mom-in-law had gone to the new Revel Casino in Atlantic City a few times and raved about the fries at the Village Whiskey they had opened there. That was unusual, the mother-in-law raving about fries. So we planned a road trip. Fries so good that mom raved? Indeed, these were fries that needed to be tried. 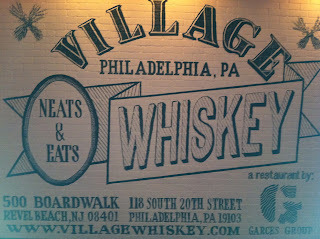 Upon arrival at the Village Whiskey in Atlantic City, it was quite a sight. Inside the huge modern confines of the casino, they had built a quaint little Philadelphia pub, nice contrast. Inside it was very dark, lit by a single candle. Old sixties psychedelic music played overhead much too loud, but it certainly did a lot to bring a dingy Philly nightclub/bar to life inside the Atlantic City casino. We did have some trouble with seating for my father-in-law as all the seating was non-conducive to the handicapped, and the staff wasn't very helpful, standing by and watching. The place is all high tables and booths, very hard to seat from a wheelchair. The attitude, not just at Revel but all AC casinos, seems to be that they only need to outfit one restaurant of their many to be handicapped friendly. Village Whiskey was just not one of them, so just cross it off your list if you're handicapped. Seriously, Disney should get into the casino business and show these folks how things should be done. Once we were all seated, which took maybe twenty minutes, again, with no help from the staff, other than to get the wheelchair out of other customers' way, we looked at the menu. It was full of several burgers mostly, a few pub offerings and a lot of alcohol, all very classy. Despite all the effort to make the place seem like a Philly bar, and the anti-handicapped seating difficulties, its Garces Group pedigree shines through. I got my usual. The fries were very thick (British chip sized, yay!) natural cuts. Crunchy on the outside, soft and hot inside, these were near perfect fries. Served in a metal cup with a cup of ketchup and ramekin of cheese, it was classy. I was not sure what to make of the duck fat. 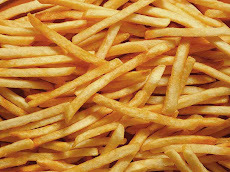 While one or two fries were greasy, they didn't taste greasy. That may be the result of the duck fat, but I didn't taste a distinct difference. They were seasoned with sea salt and cracked black pepper, and maybe a bit of rosemary or parsley. Very good fries. The tiny tin cups of fries however were seven dollars an order, and were said by the waitress to serve two or three diners. Two or three what, I don't know, maybe two or three baby birds, perhaps? I know I didn't get enough. The fry crumbs in the bottom of the cup weren't cool and kinda disturbing. The Duck Fat Fries also come with sly fox cheddar cheese for nine dollars, and with shortrib and cheddar for a whopping fourteen dollars. 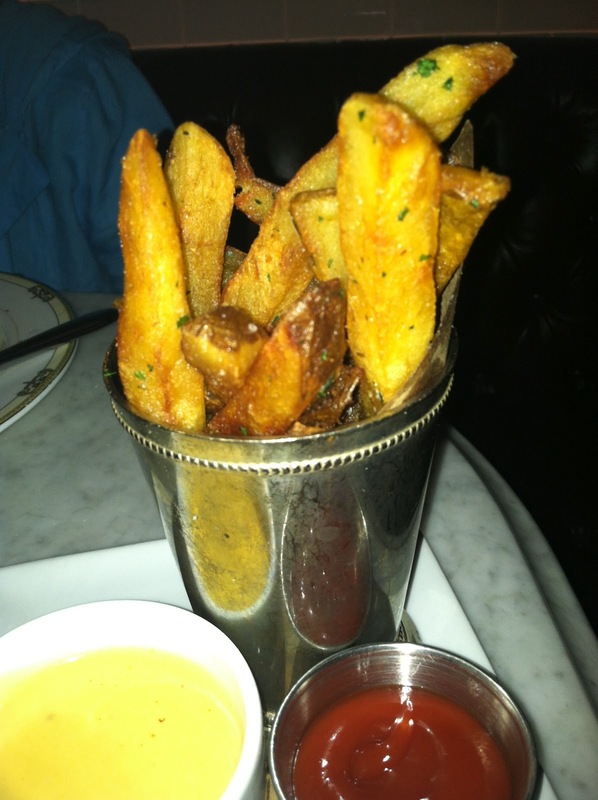 Whoa, these are expensive fries. The burger was huge, like a filet mignon of chopped beef on a big old baked roll, and very tasty. It was hard to finish, but I did. It was that good as were the Duck Fat Fries. The fries get a solid thumbs up. I might not be back to this location because of the seating, but the fries were definitely worth it, even if a bit expensive. Recommended. I am guessing you don't know the reason why duck (or in some cases goose) fat is used in frying. Most commercial vegetable oils are heavily processed and in our little "health nazi" world, can be bad (trans fat). With the advent of "natural" cooking technique, animals fats are back in vogue due to their minimal processing. Ducks and geese are large producers of easily removed fat from their skin. That fat is then slowly rendered into oil, thus it is minimally processed. Duck Fat (oil) is most prevalent in french cooking, but many of today's chefs have been turning to it more and more because it is no higher in cholesterol than standard vegetable oil. Duck Fat is also known to be more stable when utilized in high temperature cooking (i.e frying). Thus your fries come out crisp on the outside and soft on the inside. See, now you too will be able to state that duck fat fries are all natural and healthy too. Ah, the French Fry Guy learns, thank you! Still, I was expecting a taste difference with the way they are hyped. I guess not. The taste part would only be prevalent based on the actual duck the fat came from. Most ducks raised in the US are from domestic stock (bland flavor). So unless you inquire at the restaurant where the duck fat comes from, I am guessing the flavor you experienced was from domestic stock. The same can be said for a potato fried in olive or peanut oil. You expect a certain floavor from the oil, but if the cook uses an inferior or low-grade product, you should anticipate inferior flavor. So, you truly have to rely on the reputation of the restaurant. It is not unheard of for a high-end restaurant to use a lower grade product at certain times when food costs rise or food pricing is volatile (like today). If the patrons are tourists, they may not noticed a difference as much as either a regular or a french fry afficiando (like yourself). You now must find another duck fat fry to compare this experience to. I'm guessing I will have to visit the Philly restaurant to get a taste of the -real- Village Whiskey, based on more than a few folks' comments. I will compare at that point, I suppose. The taste via the oil is an important factor. You mentioned olive oil, used to make Spanish fries. At Nodding Head in Philly they are phenomenal, and the taste is evident in every bite. Yet Elevation Burger claims to use olive oil as well, and you certainly wouldn't know from the taste. French Fry Diary 401: Wildfire BBQ Co.